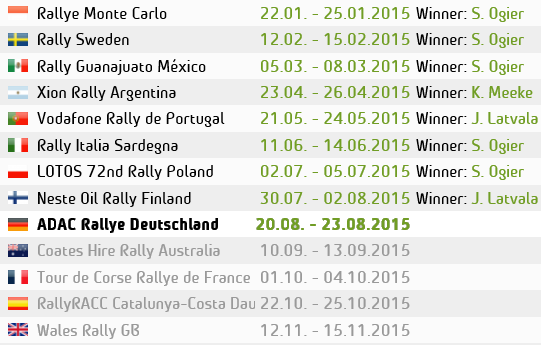 This years Rally finland, formerly know as rally of 1000 lakes, Was based in the usual city of Jyväskylä. It was the 60th anniversary of the event and for this year had a change of format from the regular three day events to just a two day event, but keeping with the same amount of mileage, meaning a lot more driving for the WRC crews in just the two days. The Rally started off on Thrusday night with a short 4.19Km stage based around a ski slope in Laajavuori, Solberg took an early lead with Hirvonen 1sec behind, with Loeb & Latvala Joint 3rd. Rally started proper On Friday morning. Hirvonen took the lead from Solberg, but on S.S4 had a massive crash from landing wrong after a small fast crest .Luckey both of them were unhurt but had to retire. By end of Day 1 Latvala was leading. Day 2 Started early, on S.S12 Raikkonen had an off and dropped out of the points. The excitement from the Finnish fans that their local hero Latvala was leading was amazing, great atmosphere and singing out on the stages. Citroen team had a battle for 2nd and 3rd between Ogier and Loeb, with Ogier once again getting the better of his 6x world champion team mate. But nothing compared to the amount of Fans at the podium finish when Latvala came out and took the top step. Setting a record of the youngest drive to win in Finland. being at the podium felt like being at a concert. This entry was posted in Photos, WRC and tagged Finland, photos, rally, Rally pics, WRC. Bookmark the permalink.